The King Koil Reflex Advance (Modena) queen medium mattress featurestwo unique elements of AH Beard’s comfort technology: AeroQuilt and AeroLatex, with Reflex Advance Pocket Springs and Performa Edge Support. 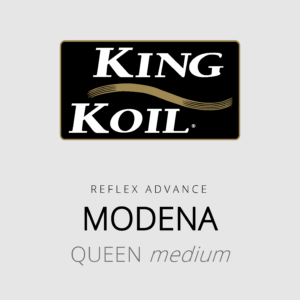 The King Koil (Modena) queen mattress with medium feel is the entry point into the brand’s range. Featuring the patented Reflex pocket spring system.